The Air King DH55 Dehumidistat Switch keeps your room properly ventilated by automatically turning your dehumidifier or central HVAC unit on or off according to the humidity level of the room and is easily adjusted from 20-percent to 80-percent to maximize the system. Constructed of thermoplastic, the switch features adjustable set points and a dial control. When the switch senses the humidity level has exceeded the set amount, the fan will turn on to exhaust the humid air. This SPST switch has 5-percent relative humidity differentials and class 1 protection. Includes a case and white cover for vertical wall mounting insulation. Perfect to use with all Air King Energy Star qualified exhaust fans to comply with the California Title 24 requirements and the CALGreen standard. 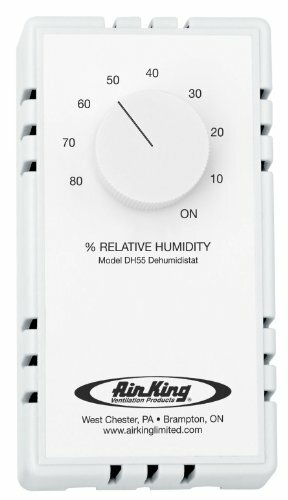 The Air King DH55 Dehumidistat Switch comes with a 1-year limited warranty. Air King offers a full line of industrial grade and commercial grade air circulating fan solutions to meet almost any need you might have. Whether your need is in industrial settings such as manufacturing plants and warehouses or more commercial setting such as offices, schools or hospitals - Air King has the perfect solution for you. Powerful motors that last for years and years are what Air King's Air Circulators have come to been know as and we are not stopping now. Visit www.amazon.com/airking for more information on Air King and our extensive line of products.